The University of Wyoming’s expertise in conservation economics has taken a step forward with the arrival of a new faculty member who has extensive domestic and international experience researching the intersection of economic and ecological systems. H. Jo Albers has joined the UW faculty to fill the newly endowed Knobloch Wyoming Excellence Chair for Conservation Economics and Finance. She comes from Oregon State University, where she was a professor in the OSU College of Forestry’s Department of Forest Ecosystems and Society and in the graduate Applied Economics program. Her UW faculty position in the Haub School of Environment and Natural Resources includes a joint appointment with the Department of Economics and Finance in the College of Business. In 2013, the Knobloch Family Foundation contributed $2 million to the Haub School toward a conservation economics endowed chair. Other Wyoming families also contributed. The state matched the gifts with funds from the Excellence in Higher Education Endowment, established by the Legislature in 2006 to create senior faculty positions for distinguished scholars and educators at UW. The Knobloch family has a strong interest in research and education that can lead to recognizing the value of natural capital including open landscapes, robust wildlife populations and functioning ecosystems. Carl Knobloch first visited Wyoming while working in the oil and gas industry. He and his family moved here permanently because of the large, intact landscapes and impressive migratory herds of deer, elk and other wildlife. 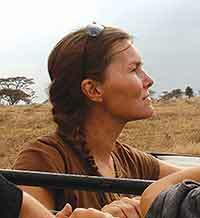 Albers, who holds a Ph.D. in economics from the University California-Berkeley and other degrees in geology and environmental studies, was a 2013 Fulbright Scholar at the University of Dar es Salaam in Tanzania, where her research and outreach focused on policies to promote both biodiversity conservation and poverty alleviation. Taking an interdisciplinary approach to research and teaching, Albers integrates information about ecological and institutional systems into economic decision frameworks at a landscape scale. She looks forward to developing new research questions and collaborations in Wyoming.